People tend to underestimate the silent era of cinema. They think that the directorial style is “primitive”, the acting is poor and the atmosphere is boring. I know not everyone thinks with such a narrow viewpoint, but far too many people do. 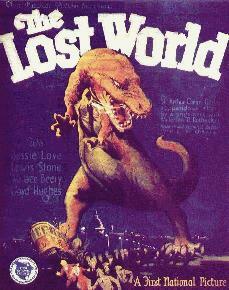 Films such as “The Lost World” prove the notion entirely wrong, with amazing technical achievements (considering the era) and an engaging story which continues to be rehashed and copied over seventy-five years later. Professor Challenger (Wallace Beery) claims that deep within darkest Brazil dwell real live dinosaurs and other prehistoric beasts. The public ridicules this idea, save for one reporter, Edward Malone (Lloyd Hughes), who wishes to journey to Brazil with Challenger to prove himself to the woman he loves. Along for the ride are Sir John Roxton (Lewis Stone), a notorious big game hunter, Summerlee (Arthur Hoyt), a stuck-up scientist, and Paula White (Bessie Love), the daughter of an explorer who disappeared while searching for the same lost world. They eventually find their destination atop a perilous plateau and quickly become the prey of blood-thirsty dinosaurs and a terrifying Ape-Man. Based on the story by Sir Arthur Conan Doyle, this tale should seem rather familiar to you; it’s been told over and over again in various incarnations on a regular basis for decades. Personally, I’ve always considered the original “King Kong” to be a remake of “the Lost World”, since the similarities are pretty much undeniable. The climax of the film even includes a brontosaurus being taken back to London to be put on display, only to break free and run amok through the city. If I had to choose between “the Lost World” and “King Kong”, my preference would definitely veer in the direction of “the Lost World”. “King Kong” may have had that sappy love story (that wasn’t even really done justice until Peter Jackson’s remake), but “the Lost World” had twice as many dinosaurs. And I love me some dinosaurs. Given the limitations of special effects back in 1925, I can’t imagine how they figured they were going to pull this film off when it went into production. Technical Director Willis H. O’Brien manages to do the impossible, bringing the rampaging giants of the Jurassic to life and working out methods which allowed them to interact with the human characters. O’Brien’s stop-motion effects are impressive, though rough when compared to his later accomplishments (such as “Mighty Joe Young” and the aforementioned “King Kong”), they’re none-the-less impressive. While movement can be a little choppy, the level of detail is rather astonishing. The dinosaurs’ chests heave in and out as they breath, they have detailed eyes which can move in all directions and even blink, they curl their lips and sneer, they drool, the works. While a far cry from the special effects we enjoy today, this was really something back in 1925. Although the story is a little on the thin side, I think it has this sort of “modern mythology” aspect to it, considering how often it has been retold and re-imagined over the years. The characters carry the film quite nicely and even if they’re not the deepest I’ve ever seen, there’s enough to them to make each one stand out. Our hero, Malone, has a love triangle going on with Gladys, Paula and Roxton. He goes to the lost world to prove himself to Gladys only to fall for Paula, whom Roxton is in love with. Challenger looks and acts like an absolute madman, which makes his interactions with the prudish Summerlee rather amusing. There’s also the Ape-Man, probably the film’s main villain, who menaces them throughout their entire stay in the lost world. The make-up used on him is quite effective and he looks somewhat unsettling in close-ups. They paired him with a goofy chimpanzee sidekick for some reason, though. “The Lost World” has been the fodder for many a late-night spook-show on public access television, which is of course where I first encountered it. Still, I think it deserves better than to be double-billed with the likes of “Plan Nine from Outer Space”. Image Entertainment recently released a magnificently restored DVD which takes the once hour-long abridged version of the film and combines it with scenes from multiple cuts to rein it in at an impressive 93 minutes in length. The presentation is glorious and truly worthy of such a classic and influential piece of film history. I’d highly recommend picking it up to anyone interested in dinosaurs, King Kong, silent films or just classic cinema in general.